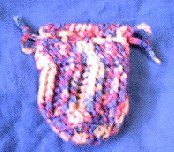 This bag can be used by boys or girls just by changing the color of the yarn and the look. Just fill with cars, dolls, trading cards, jacks, etc to make a happy child. The pictures don't do it justice. This is really a cute bag. Worsted Weight Yarn - about 2 ounces. Ch 3, Join to form a ring. Rnd 1: Ch 3, 10 dc in ring. Join with a sl st to top of ch 3(join this way through out pattern). Rnd 2: Ch 3, 2 dc in each dc around, join. Rnd 3: Ch 3, dc in back loop of each dc around, join. Rnd 4: Ch 3, *2 dc in next dc, dc in next dc, repeat around, join. Rnd 11 and 12: Ch 3, dc in each dc around, join. Rnd 13: Ch 4, skip 1st dc, *dc in next dc, ch 1, skip next dc, repeat around and joun with sl st in 3rd ch. Rnd 14: Ch 1, reverse sc in each ch and each dc around. Join in top of 1st st and fasten off. Weave in ends. Ch 60 and fasten off. Weave through Rnd 13 and tie ends together.